The earliest people known to have lived at Pukerua are the Ngāti Ira, who also build a pa near today’s Pa Road. Later, the Muaūpoko live in the area from Lake Horowhenua to Pukerua, where they build Waimapihi Pa near today’s Rawhiti Road’s northern end. Pukerua is on the main route for Maori travellers going north or south. 1822: Te Rauparaha comes south to the Kāpiti coast and at Pukerua exterminates the Muaūpoko because of their earlier treachery towards him when they feared their lands would be invaded. Led by Te Rauparaha and Tuwhare, Ngāti Toa attacks their last stronghold, the Waimapihi Pa, eventually taking it by using deception. 1849: The coach road north – today’s Paekakariki Hill Road – is opened, bypassing Pukerua. The only access to Pukerua is still a foot track from Taupō (today’s Plimmerton). Blocks originally surveyed in the 1870s. 187? : The originally surveyed blocks – Wairaka, Pukerua and Waimapihi – are granted to various members of Ngāti Toa. The Waimapihi block is sold by Rauparaha (son of the Ngāti Toa leader), Mātene Te Whiwi (Te Rangihaeata’s nephew), Rakapa Kahoki (Te Rangihaeata’s niece) and Hoani Te Okoro (Te Rauparaha’s nephew) to Frederick Bright in 1875. 1886: The Wellington and Manawatu Railway Company extends their railway line through Pukerua. Since there is no road yet into Pukerua, the material for the construction of the railway is offloaded from ships anchored off Pukerua into small boats and brought to the beach. From there, a tramway takes the rails, sleepers and bricks up to the railway track (near where Muri Station is today). During the last stage of finishing the tunnels between Paekakariki and Pukerua, passengers coming from south have to leave the train at Pukerua, climb down to the beach and continue by rail on temporary tracks to Paekakariki. 1909: Charles Gray purchases part of the Pukerua block and proceeds to subdivide and sell sections to Norma Ames. 1919: Charles Gray buys the Waimapihi block from Frederick Bright. Between 1919 and 1921, the newly opened Post Office is called Waimapihi and for a short time also the train station. 1922: Land along Ocean Parade is subdivided by Charles Gray into residential sections. Prior to this subdivision, less than a dozen families live in Pukerua. The area is advertised as having the climate and air qualities of a health resort and Pukerua experiences tremendous growth over the next decade. 1923: Charles Gray builds his family’s homestead, today the oldest still standing building in Pukerua Bay. A tennis club is established as the first local sporting club, mainly attended by weekend visitors. It is located on a site provided by Charles Gray at the corner of Pa Road and the Main Highway. The train station is renamed to Pukerua Bay to distinguish it from the South Island station Pukerau. 1924: Mrs. Ames opens a small store above the zigzag path to the beach. The store offers provisions for the few permanent residents and weekend visitors to the bay. Later, the Ames family also operates a small shop on the beach to save picnickers having to climb up to the store. 1925: Lindsay’s General Store opens on the corner of today’s Toenga Road and State Highway 1. 1926: On March, 20th, a ceremony attended by J G Coates, Prime Minister, is held to open the roads leading from Pukerua Bay station to the beach (replacing a steep track) and to Lindsay’s store. The road into Pukerua Bay from Plimmerton is still only a track, often slippery and muddy during winter months. 1927: Pukerua Bay School is officially opened on May, 21st on land donated by Charles Gray. Before this, children had to catch the train to Plimmerton to attend school. After three months of work, on October, 1st, electricity is put through from Plimmerton to Pukerua Bay and celebrated with an afternoon party and a dance in the evening. Hutt County Council authorises the erection of 13 street lamps. 1928: The road from Plimmerton (known as the Old Pukerua Road) is properly formed. However, road access from Porirua still leads around the Pauatahanui Inlet and via Karehana Bay as there is no bridge at Paremata yet and no road through Taupō swamp north of Plimmerton. 1929: Pukerua Bay now comprises about 100 houses. Casey’s Plimmerton Butchery begins delivering meat to Pukerua Bay, first by horseback, later by van. 1934: Bathing sheds are opened to cater for the increasing number of visitors to the beach. 1935: A nine-hole golf course is opened where today’s local shops are located. The golf club operated until 1950. 1936: Work begins on the section of highway between Plimmerton and Paekakariki. One house in Pukerua Bay has to be moved and some properties lost parts of their sections. Mrs. Ames’ store is closed and a new store is built, later converted into a tea-room and fish and chips shop. 1937: The railway line from Wellington is re-routed through two new tunnels, significantly shortening the travel time between Wellington and Pukerua Bay. 1939: Centennial Highway between Pukerua Bay and Paekakariki is opened to traffic on November, 4th. 1940: Double-tracking of the railway line from Wellington is completed and the present Pukerua Bay station with an island between the two tracks replaces the old building. The line is also electrified up to Paekakariki. 1946: The present tennis courts are laid down by the Public Works Department. 1949: Multiple-unit electric trains are introduced between Wellington and Paekakariki. 1952: The first church in Pukerua Bay, St. Luke’s, is built on a section donated by Charles Gray. It is used by both Methodist and Presbyterian ministers. Volunteers of the local RSA construct the Scout Hall on land in Teihana Road (later relocated). In July, Muri Station is opened as the centre of the population of Pukerua Bay is located closer to that area (Haunui, Muri, Pukerua Beach). 1953: An automatic telephone exchange is built to service the 115 phone subscribers in Pukerua Bay previously handled from Plimmerton. 1956: St. Mark’s Anglican Church is dedicated in Rawhiti Road on a site donated by Mrs. Isabella Wall. 1958: The new post office building opens on January, 8th. Previously, the post office had operated first in Ames’ store and then in a separate shop. Residential housing growth pre-1930 to present day. In the 1950s and 1960s, Pukerua Bay sees significant growth of its residential population. The completed highway and electric train services make Pukerua Bay a viable choice to live in for people commuting to work as far as to Wellington. 1965: In July, the Scout Hall is relocated from Teihana Road to its present site at the end of Kotipu Place, next to the Greenmeadows Reserve. 1969: The present group of shops between Rawhiti Road and State Highway 1 is built. 1973: Pukerua Bay joins Porirua City, mainly to get the issue of water and sewerage addressed. The School-Community Hall is opened in September. The hall was financed by the community and Porirua City Council and the Wellington Education Board permitted the hall to be built on school grounds. 1976: The first stage of water and sewerage infrastructure is completed. 1977: Pukerua Bay Kindergarten is established after years of fundraising and efforts to obtain land. 1988: Despite lobbying by local people, the Pukerua Bay post office is closed on February, 5th by the newly formed New Zealand Post. 1989: The overbridge over State Highway 1 is opened on April, 3rd, after a long fight by local residents, which included continually walking across the pedestrian crossing to hold up traffic. The bridge was allocated from Mugavin Avenue, Porirua by the Porirua City Council and the then National Road Board. 1997: Tony Jackman takes the initiative to restore Waimapihi Stream gully, known as the Secret Valley, to its native state. Over the next few years, the initiative grows with the help of several community groups and results in the building of a walking track with several small bridges, sculptures, and an education centre. 2011: Muri Station is closed on April, 30th, after 59 years, due to “safety risks” that would be costly to address. 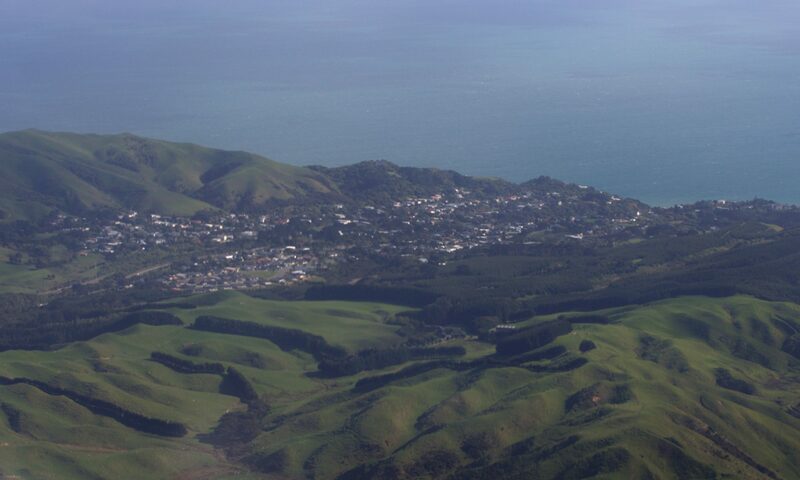 The decision was reached by a Greater Wellington Regional Council committee despite submissions by the community’s users of the station and a petition by the Pukerua Bay Residents’ Association. 2012: A six meter high carved Pou Tangaroa is placed on the Pukerua Bay foreshore at the end of Ocean Parade. A dawn ceremony on December, 1st to unveil and bless the pou is attended by about 100 people.